“Ishikawa diagrams (also called fishbone diagrams, herringbone diagrams, cause-and-effect diagrams, or Fishikawa) are causal diagrams created by Kaoru Ishikawa that show the causes of a specific event. The code creates a new instance of the FishboneDiagram* class with the name “fdiag”. We can use this name to access the object in code. If the subclauses of your model were objects instead of strings as in our FBClause class you should use the SubLabelPath property to set the name of the field that will provide data for the subclause labels. Compile and run the sample and you will see a perfect fishbone diagram. 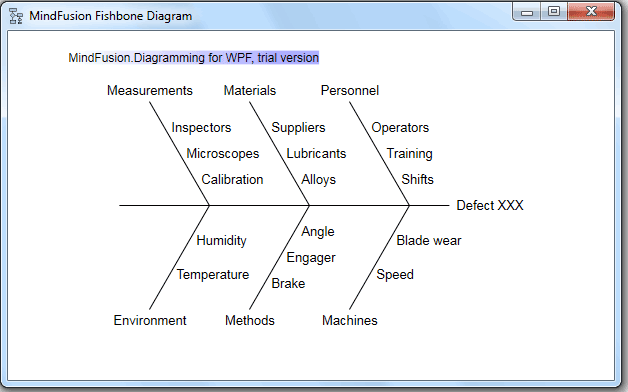 * The FishboneDiagram class will be officially released with the next version of the WPF Diagram Tool. About Diagramming for WPF: This is the right tool to create flowcharts in WPF that always meet your requirements. The library offers more than 100 predefined node shapes, extensive event set and more than 15 exporters and importers. Each diagram that you build has a completely customizable look through styles, themes and appearance properties for each part of the flowchart. The numerous samples and detailed documentation help you learn quickly how to integrate the component into your own application. You can download the trial version, which has no feature restrictions and does not expire from the WPF Diagram Page on MindFusion website.